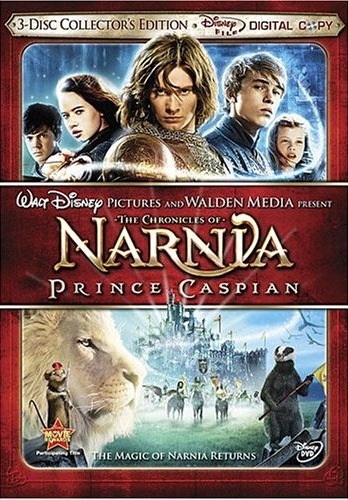 This is the first NarniaWeb Fan Audio Commentary for “The Chronicles of Narnia: Prince Caspian.” Watch the film and listen to Rilian, GymFan15, and GlumPuddle as they share their thoughts on each scene. This version should work on all Blu-ray Discs and Digital Files worldwide. *Select the NTSC version if you are watching a digital file or Blu-ray Disc. This will only work if you synchronize your movie with the Commentary audio file. The ideal way to listen to the Commentary is to watch the Digital File, which is included with the 3-Disc edition, or can be downloaded from iTunes. But you can also watch the DVD or Blu-ray. If you are watching the Digital File (recommended), pause your movie at the 30-second mark [0:00:30]. If you are watching the DVD, pause your movie at the 34-second mark [0:00:34]. (We recommend watching the DVD on a TV and the Commentary on a computer because it’s easier to pause that way). You should now be paused near the end of the Disney logo. Start playing the Commentary (but not the movie yet) on your computer. Rilian will begin counting down from five. When he says “Play,” start playing your movie. If you have synchronized correctly, Rilian should begin talking again just after the Walden Media text fades out. Problems or questions? Send us some feedback. What if I have to pause? If you have to take a break, press Pause on the movie and Pause on the commentary at the same time. When you return, press Play on the movie and Play on the commentary at the same time. This is slightly more difficult if you are watching the movie on your computer. But, if you’re watching the Digital File, all you have to do is make sure the time codes match. If you are watching the DVD, we recommend you not watch it on a computer. Watch the DVD on a television and play the Commentary on a computer. What if I am watching the DVD and I can’t finish the whole Commentary in one day? 1. Press Pause on the movie and Pause on the commentary at the same time. 2. Write down the time codes for the movie and the Commentary. There may be a few seconds difference, or they may match. 3. When you return, pause the movie and Commentary at the exact point where you left off. 4. Press play on the movie and commentary at the same time. What if I am watching the Digital File or Blu-ray and I can’t finish the whole Commentary in one day? This is pretty simple. The Digital File and Commentary time codes match exactly. So, if you’re watching the Digital File, all you have to do is make sure they match up. The Blu-ray time code is always one-second behind the Commentary time code. So, for example… If the Blu-ray time code is at 31:24, the Commentary time code should be at 31:25. History: I’ve loved the Narnian chronicles since my father first read them to me when I was around seven. The stories of children exhibiting bravery, chivalry and honour made an enormous impact on my life. Since then I have hoped against hope that someone would film the entire series. I first heard rumors back in 2002 that someone had acquired the rights and was planning to begin production within the next couple of years. I found NarniaWeb in 2003 and joined in August ’04 and eventually started up a podcast and recently a video blog. Outside of Narnia, I enjoy studying a myriad of subjects in relation to culture and apologetics in addition to studying film and media. History: I’m a relative newbie to Narnia; having only read the books for the first time in the spring of 2005. I started following the movie process soon afterward, and the rest, they say, is history, with me now being a NarniaWeb moderator and the webmaster of my very own Narnia site, Spareoom.net. All that, in a little over a year from when I first read the books. That’s awfully fast, if I do say so myself. Outside of Narnia, I enjoy reading, writing and counted cross-stitch. I love contributing to various communication outlets such as the forum and the podcasts, and I hope someday to have a Narnia opinion blog of my own. History: My grandfather taught a college course on Lewis and Tolkien, so I grew up having a basic knowledge of what Narnia was and had most of the books read to me as a kid. I became a fanatic in early 2001 when I read the series all the way through for myself. The books bring back the magic of story time, and I love Lewis’ ability to explore complex concepts through fairly simple stories. After the Fellowship of the Ring film became a box office smash, I started doing frequent Google searches for “Narnia movie.” A few months later (early 2002), I heard a rumor about someone acquiring the rights and started following the news. In June 2007, I was given the incredible honor of visiting the Prince Caspian film set in Prague to write reports for NarniaWeb. I am currently in college majoring in Telecommunication.